PROVIDENCE is a tale of love and heartbreak, (literally and figuratively), infused throughout with a powerful longing for something that's just out of reach. I. LOVED. IT. !! Young Jon Bronson is stolen away from his life and his first love, Chloe. He wakes up in a body he doesn't recognize because it's been 4 years since he was taken. The only clue he has as to what happened is a copy of Lovecraft's THE DUNWICH HORROR which contains a short note to him inside. He soon discovers this book is not the only reminder he has of his experience. What is the other reminder? Will Jon be able to resume his life at school, with his parents, with Chloe? You'll have to read this to find out! I'm not going to lie, at first I was disappointed to discover this wasn't a book about Joe Goldberg. Then when I heard this tale was somehow related to Lovecraft I was excited again. Turns out, this tale is actually only tangentially related to Lovecraft, so those unfamiliar with his work need not worry. It also turns out that Jon Bronson is a much better person than Joe Goldberg EVER could have been. That is the fact that made this book so difficult to put down. Look, I'm the type of person that loves it when everybody dies at the end of a story. The fact that I was rooting so hard for Jon surprised even me! There is a whole other subplot going on here, involving Eggs, (a police officer) and Lo, his wife. While the story of Jon and Chloe involves young love with more than the normal obstacles in the way, Eggs and Lo showcase an entirely different tale of love-the long term marriage kind; the marriage facing major obstacles kind. Somehow, Eggs and Lo sneaked in through the back door of the main plot and stole my heart. I just wanted so badly for them to make it through. All of this proves to me how powerful and capable of a writer Caroline Kepnes really is. 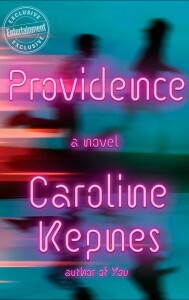 These are not my types of stories: YOU, HIDDEN BODIES and now PROVIDENCE. I am not a romance reader, but somehow I became wholly invested in the fates of Jon and Chloe, of Eggs and Lo. I hope that that all of their stories will captivate you as well. If any of what I've written sounds appealing to you, go and get this book and find out what happens. Come seek me out when you're done and we'll shed our tears together.